We’re a few days into a new year and I’m sure many of you have already broken free of those pesky restrictions of your New Year’s resolutions. This year I have convinced myself to set some lofty goals, and some “not so” lofty goals. Things I should be doing; taking better care of myself with exercise, drinking more water and eating less. It’s difficult to do the right things even though we know its best for us. Damn the slippery slope and the path of least resistance. Why does it have to be so hard to be better? Oh, that’s right – we have to want to. I’ve always had a pretty positive attitude and a good outlook on life, so for me setting goals isn’t that hard. I automatically assume when I set my mind to something I’m going to make it happen. Again, it comes down to how bad you want it and what you’re willing to do to make it happen. Sometimes it’s just making your mind up and taking that first step, and I’m sure for many it can seem to be uphill both ways. Hey, no one said it would be easy, but more often than not it’s not as hard as we thought it would be. Go figure. I’ve set a couple of personal goals this year. 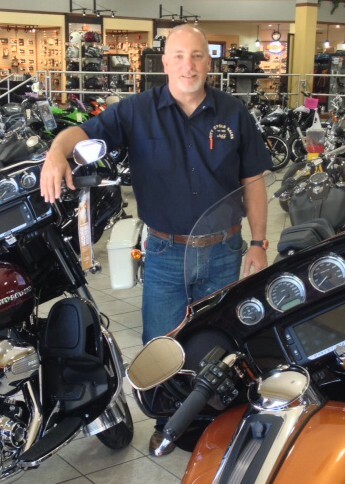 One is to get a little deeper into this motorcycle industry than I have ever been before. Making my living selling motorcycles is fine but I want to be involved in this industry on a much larger scale. Global? Can a small town boy from Kansas be global? Sure. Is that one of my goals? Lofty, but no. When you’re passionate about something it should come natural, and if you know me you know I’m passionate about motorcycles. Right now I’m not sure if this particular goal can be measured. Further into the industry can mean a lot of things I guess, but everything is measured in steps. So any step forward is one step closer to a goal – wherever that goal is. I wish I had more definition on what this goal is. To give such a broad statement with expectations of hitting a goal without clear objectives can be difficult. I think when it happens (not if it happens) I will know that my goal has been achieved. Part of making and achieving goals is to push yourself to do something more than you would normally. Just as in exercising, if you don’t take that first step…I think you know where I’m going with this. A goal is the same thing no matter what it is. By just proclaiming your goals you’ve made that first step of recognizing you want more. But as in all things worth achieving, it takes work and determination, focus and a willingness to accept those “two steps back” moments and turn them into one step forward. I have challenged myself and I challenge you to do the same. Embrace the uphill in whatever it is you want to achieve and the rewards will be worth it. I’m looking forward to it. Definitely one of the most inspiring things I’ve read in a while….That last paragraph is truly brilliant!! Thank you for sharing jeff!! This is great! Good for you setting some lofty goals and stating them outloud. That’s the hardest for me. I have one very lofty goal I have set but I’m terrified to tell people. There are a total of 5 people in my circle that know. It’s the uphill battle you speak of that I’m terrified of. Ha. Can’t wait to see what you have in store form yourself. Keep us updated on the small accomplishments along the way! Thank you and I will! Those 5 in that close-knit circle are very special people in your life and they are supporting you all the way!